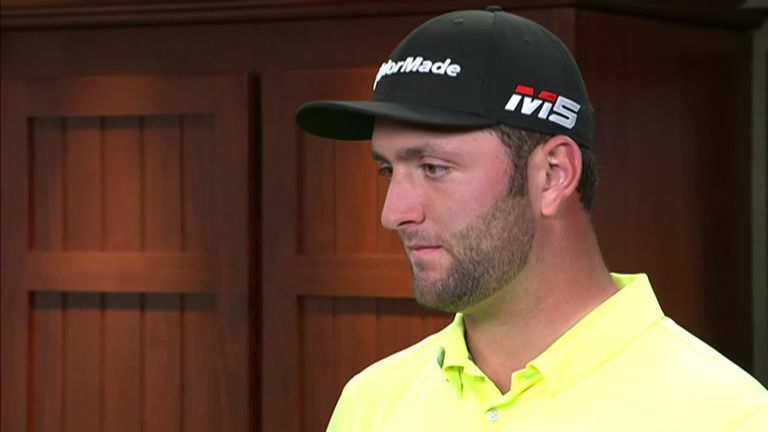 Jon Rahm's patient approach paid off as he opened his Masters campaign with a three-under 69 at Augusta National. The Spaniard, who finished fourth last year, made an early move up the leaderboard with back-to-back birdies at the third and fourth, but gave those shots back with bogeys at the fifth and eighth. He was back in red numbers with a birdie at the ninth and further birdies at the 11th and 13th earned him a fourth successive round in the 60s at the course. "I didn't have my best, I was a little shaky with the driver," he said. "[But] I was able to keep it in the fairway for the better part today. My iron play also didn't feel the best, but again I was able to manage it and hit some quality shots out there. "But I think that the most important thing is I never lost patience. I was one over par on the par‑fives going to the back nine where it's easy to get a little frustrated and I didn't. I kept my cool and I was able to make a great birdie on nine and get where I'm going. "It's tough out there, it's not easy, they made a few changes to the golf course, they put some tough pins early in the day already, the greens started getting progressively firmer, so just being able to make a couple good putts and shoot under par is a good round." Adam Scott matched Rahm's 69 as he carded his best round at Augusta National in five years. The 2013 champion parred the first six holes before dropping a shot at the seventh, but he bounced back from that with birdies at the eighth and ninth. A bogey at the 12th took him back to level par, but he produced a strong finish with birdies at the 15th, 17th and 18th to move into a share of the lead. "It's a great start on a kind of tricky day," said the Australian. "One of the things, generally in my career, I'm kind of a slow starter, certainly the last 10 years. I don't jump out of the gates, it seems. So I don't know if this is jumping out of the gates, but it certainly is great. "I was confident with my game generally and so I was just waiting for the chance, maybe some experience showed up in that. "I never really got frustrated with anything, even with the bogey on 12, which was a little disappointing, but I knew I would get the right number somewhere and I got a nice one into 15, which is always nice, because you don't like fiddling with hitting a 200‑yard‑plus shot into that hole. "And then 17 and 18 I hit great drives and had good numbers and took advantage. And that's kind of what you have to do, get some momentum going. I feel like teeing off from this position tomorrow afternoon is a hell of a lot better than even par." Denmark's Lucas Bjerregaard reaped the rewards for doing his homework with a two-under 70 on his Masters debut. Bjerregaard's round included five birdies, one bogey and a double bogey on the fourth, where his wayward tee shot hit a female spectator on the head. "I feel like I've done my homework," he said. "I've watched the tournament on TV the last 15 years so I know a little bit from that. "Obviously my caddie, Jonathan (Smart) won with Danny Willett here in '16 so he knows his way around and I've been relying on him quite a bit. We came here and had a look at the course and we did our homework well and today really showed that. "I drove it nicely, but then I was able to put it in some good spots where it was pretty stress-free, didn't have to fight for my par that much other than a couple of holes, so that was nice."